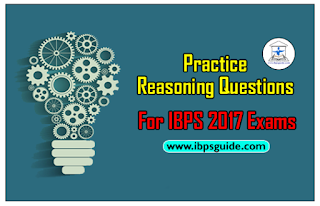 Dear Readers, Important Practice Reasoning Questions with explanation for IBPS Exams 2017 was given here with explanation, candidates those who are preparing for Banking and all other Competitive exams can use this practice questions. 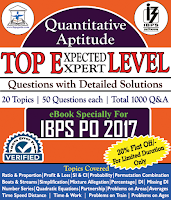 Directions (Q. 1-5): Study the following information carefully and answer the questions given below it. (i) If both the first and last elements are vowels, the codes for the vowels are to be interchanged. (ii) If the group of elements contains a single vowel, that vowel is to be coded as the code for the element following it. (iii) If the second element is a vowel and the fifth element is a consonant, the vowel is to be coded as the code for the consonant. Directions (Q. 6-10): These questions are based on the following letter / number/ symbol arrangement. Study it carefully and answer the questions that follow. 6.Which of the following is sixth to the right of the nineteenth from the right end of the above arrangement? 6. Sixth to the right of the 19th from the right end, that is (19 – 6 =) 13th from the right, ie 4. 7. How many such consonants are there in the above arrangement each of which is immediately preceded by a symbol and immediately followed by a letter? 8. If all numbers are dropped from the above arrangement, which of the following will be the fourteenth from the left end? 9. How many such numbers are there in the above arrangement each of which is immediately preceded by a vowel? 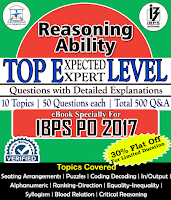 10.If it is possible to make a meaningful word with the fifth, sixth, eighth, twelfth, twentieth and twenty-third letter of the above arrangement, which of the following will be the fourth letter from the left?